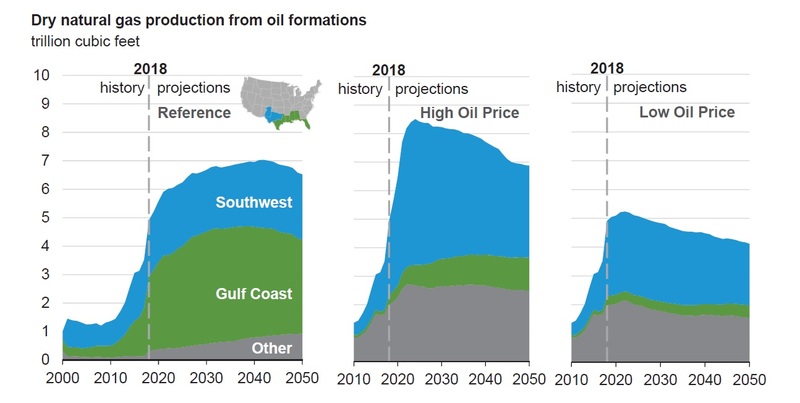 What follows is an excerpt from the US Energy Information Administration’s (EIA) Annual Energy Outlook 2019. This report was prepared by the EIA, the statistical and analytical agency within the US Department of Energy. By law, the EIA’s data, analyses, and forecasts are independent of approval by any other officer or employee of the United States Government. The views in this report therefore should not be construed as representing those of the Department of Energy or other federal agencies. 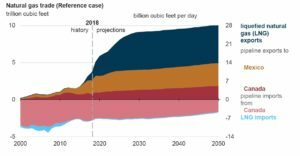 The Annual Energy Outlook is published to satisfy the Department of Energy Organization Act of 1977, which requires the administrator of the EIA to prepare annual reports on trends and projections for energy use and supply. The annual energy outlook (AEO) provides long-term energy projections for the United States. 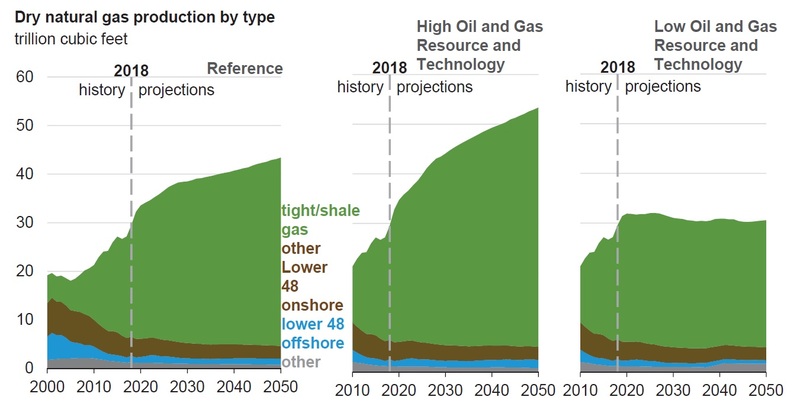 Projections in the Annual Energy Outlook 2019 (AEO2019) are not predictions of what will happen, but rather modeled projections of what may happen given certain assumptions and methodologies. The AEO is developed using the National Energy Modeling System, an integrated model that captures interactions of economic changes and energy supply, demand, and prices. 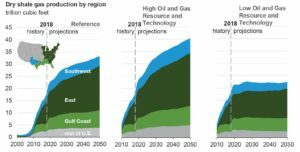 Energy market projections are subject to much uncertainty because many of the events that shape energy markets as well as future developments in technologies, demographics, and resources cannot be foreseen with certainty. To illustrate the importance of key assumptions, AEO2019 includes a reference case and six side cases that systematically vary important underlying assumptions. 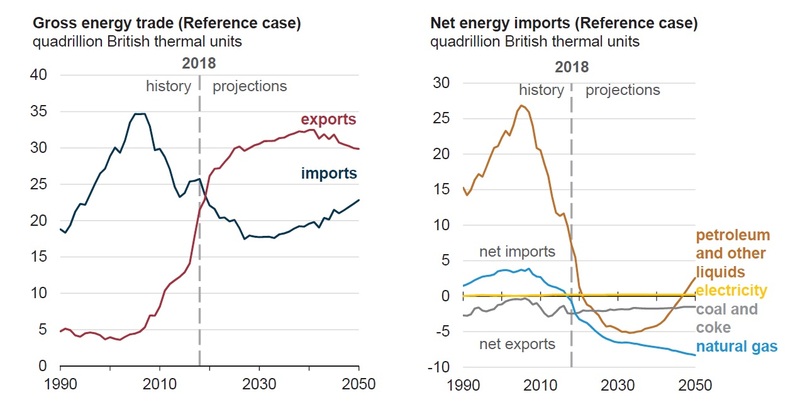 The AEO2019 reference case represents the EIA’s best assessment of how US and world energy markets will operate through 2050, based on many key assumptions. For instance, the reference case projection assumes improvement in known energy production, delivery, and consumption technology trends. The side cases in AEO2019 show the effect that changing important model assumptions have on the projections when compared with the reference case. Two AEO2019 side cases are the high and low oil price cases, which represent international conditions outside the US that could collectively drive prices to extreme, sustained deviations from the reference case price path. Additional AEO2019 side cases are the high and low oil and gas resource and technology cases, where production costs and resource availability within the US are varied, allowing for more or less production at given world oil and natural gas prices. The US continues to produce large volumes of natural gas from oil formations, even with relatively low oil prices – putting downward pressure on natural gas prices (Table 1). 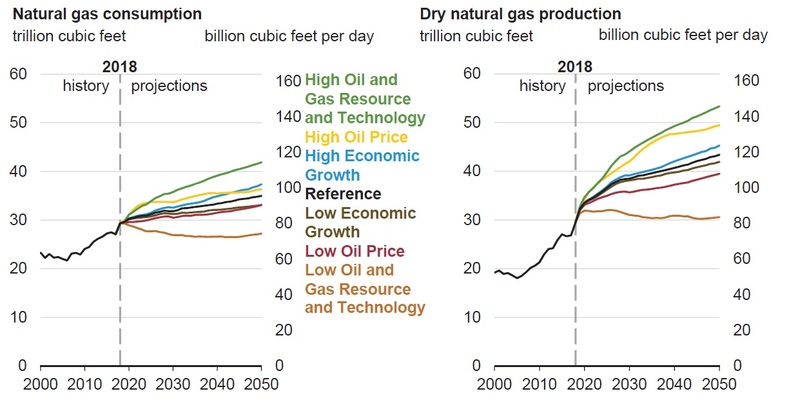 The percentage of dry natural gas production from oil formations increased from 8% in 2013 to 17% in 2018 and remains near this percentage through 2050 in the reference case. Growth in drilling in the Southwest US region, particularly in the Permian Basin, is the main driver for natural gas production growth from tight oil formations. The low oil Price case, with the US crude oil benchmark West Texas Intermediate price at US$58 per barrel or lower, is the only case in which natural gas production from oil formations is lower in 2050 than at current levels. The level of drilling in oil formations primarily depends on crude oil prices rather than natural gas prices. Increased natural gas production from oil-directed drilling puts downward pressure on natural gas prices throughout the projection period. Natural gas experiences the largest production increase of all fossil fuels during the projection period across all cases, driven by continued development of lower-cost shale gas and tight oil resources. The growth in natural gas production supports increasing domestic consumption, particularly in the industrial and electric power sectors, and higher levels of natural gas exports. US dry natural gas consumption and production increase in most cases with production growth outpacing natural gas consumption in all cases (Table 2). Natural gas production in the reference case grows 7% per year from 2018 to 2020, which is more than the 4% per year average growth rate from 2005 to 2015. However, after 2020, growth slows to less than 1% per year as growth in both domestic consumption and demand for US natural gas exports slows. Across the reference and all sensitivity cases, recent historical and near-term natural gas production growth in an environment of relatively low and stable prices supports growing demand from large natural gas- and capital-intensive projects currently under construction, including chemical projects and liquefaction export terminals. After 2020, production grows at a higher rate than consumption in most cases, leading to a corresponding growth in US exports of natural gas to global markets. The exception is in the low oil and gas resource and technology case, where production, consumption, and net exports all remain relatively flat as a result of higher production costs. The low oil and gas resource and technology case, which has the highest natural gas prices relative to the other cases, is the only case where US natural gas consumption does not increase during the projection period. 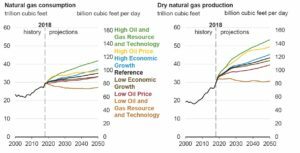 US dry natural gas production increases as a result of continued development of tight and shale resources, which account for nearly 90% of dry natural gas production in 2050 (Table 3). Natural gas production from shale gas and tight oil plays as a share of total US natural gas production continues to grow in both share and absolute volume because of the sheer size of the associated resources and because of improvements in technology that allow for the development of these resources at lower costs. In the high oil and gas resource and technology case, cumulative production from shale gas and tight oil is 8% higher than in the reference case. Conversely, in the low oil and gas resource and technology case, cumulative production from those resources is 24% lower. Across all cases, onshore production of natural gas from sources other than tight oil and shale gas, such as coalbed methane, generally continues to decline through 2050 because of unfavorable economic conditions for producing that resource. Offshore natural gas production in the US remains nearly flat during the projection period in all cases as a result of production from new discoveries that generally offsets declines in legacy fields. Eastern US production of natural gas from shale resources leads growth in the reference case, followed by growth in Gulf Coast onshore production (Table 4). Total US natural gas production across most cases is driven by continued development of the Marcellus and Utica shale plays. Natural gas from the Eagle Ford (co-produced with oil) and the Haynesville plays in the US Gulf Coast region also contributes to domestic dry natural gas production. Associated natural gas production from tight oil production in the Permian Basin region grows strongly in the early part of the projection period but remains relatively flat after 2030. Technological advancements and improvements in industry practices lower production costs in the reference case and increase the volume of oil and natural gas recovery per well. These advancements have a significant cumulative effect in plays that extend over wide areas and that have large undeveloped resources (Marcellus, Utica, and Haynesville). Natural gas production from regions with shale and tight resources show higher levels of variability across the resource and technology cases, compared with the reference case because assumptions in those cases target those specific resources. 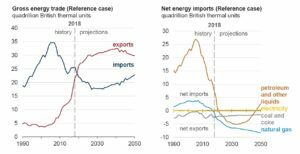 The US has been a net energy importer since 1953, but continued growth in petroleum and natural gas exports results in the United States becoming a net energy exporter by 2020 in all cases. In the reference case, the US becomes a net exporter of petroleum liquids after 2020 as US crude oil production increases and domestic consumption of petroleum products decreases. Near the end of the projection period, the US returns to being a net importer of petroleum and other liquids on an energy basis as a result of increasing domestic gasoline consumption and falling domestic crude oil production in those years (Table 5). The US became a net natural gas exporter on an annual basis in 2017 and continued to export more natural gas than it imported in 2018. In the reference case, US natural gas trade, which includes shipments by pipeline from and to Canada and to Mexico, as well as exports of liquefied natural gas (LNG), will be increasingly dominated by LNG exports to more distant destinations. US net exports of natural gas continue to grow in the reference case as LNG becomes an increasingly significant export (Table 6). In the reference case, US LNG exports and pipeline exports to Canada and to Mexico increase until 2030 and then flatten through 2050 as relatively low, stable natural gas prices make US natural gas competitive in North American and global markets. After LNG export facilities currently under construction are completed by 2022, US LNG export capacity increases further. Asian demand growth allows US natural gas to remain competitive there. After 2030, US LNG is no longer as competitive because additional suppliers enter the global LNG market, reducing LNG prices and making additional US LNG export capacity uneconomic. Increasing natural gas exports to Mexico are a result of more pipeline infrastructure to and within Mexico, resulting in increased natural gas-fired power generation. By 2030, Mexican domestic natural gas production begins to displace US exports. As Canadian natural gas faces competition from relatively low-cost US natural gas, US imports of natural gas from Western Canada continue to decline from historical levels. US exports of natural gas to Eastern Canada continue to increase because of its proximity to US natural gas resources in the Marcellus and Utica plays and because of recent additions to pipeline infrastructure. Net exports of natural gas from the US continue to grow in the reference case because of near-term export growth and LNG export facilities delivering domestic production to global markets (Table 7). In the reference case, pipeline exports to Mexico and LNG exports increase until 2025, after which pipeline export growth to Mexico slows and LNG exports continue rising through 2030. Increasing natural gas exports to Mexico are a result of more pipeline infrastructure to and within Mexico, allowing for increased natural gas-fired power generation. By 2030, Mexican domestic natural gas production begins to displace US exports. Three LNG export facilities were operational in the lower 48 states by the end of 2018. After all LNG export facilities and expansions currently under construction are completed by 2022, LNG export capacity increases further as a result of growing Asian demand and US natural gas prices remaining competitive. As US-sourced LNG becomes less competitive, export volumes stop growing, remaining steady during the later years of the projection period. US imports of natural gas from Canada, primarily from its prolific western region, continue to decline from historical levels. US exports of natural gas to Eastern Canada continue to increase because of Eastern Canada’s proximity to US natural gas resources in the Marcellus and Utica plays and additional, recently built pipeline infrastructure.